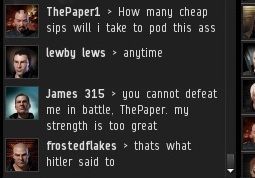 If you have been on the internet for awhile, you have probably heard of Godwin's Law. 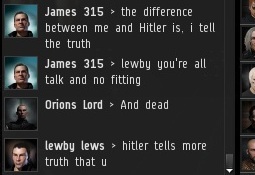 I have noticed the highsec miners are becoming increasingly reliant on Hitler comparisons when they attempt to dissuade me from my noble quest. Surely this is a sign of desperation on their part. Opponents of the New Order have actually interpreted this rule as offering special protection to the historically underprivileged group known as "highsec miners". I can hardly be compared to a fascist dictator when my shareholders voted to expand my power over Kamio in a free, fair vote. Yet frostedflakes persisted. As if he had discovered something profound, he dug in, and suddenly everything became a Hitler comparison. But for some miners, Hitler wasn't so bad: At least he left their mackinaws and retrievers alone. You can't win with these people. First it's fascist to try bringing order into the system, next there's too much chaos? By this point, frostedflakes was clearly reaching. But he stuck to his guns. If bumping miners is reminiscent of the Holocaust, then blocking me in local is like burning books. 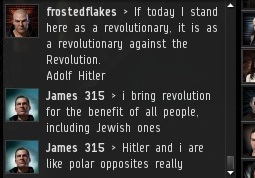 Come to think of it, Hitler didn't spend much time in front of a keyboard, so doesn't that mean AFK miners are kind of like Nazis? I must say. At this stage I have no more sympathy for the miners that keep feeding this website. They are in effect responsible for their own demise. You (James 315) are still wildly psychotic, and your beliefs border on the insane. I guess you saw gap and took it. Kandoren, when can I officially welcome you into the New Order, my friend? 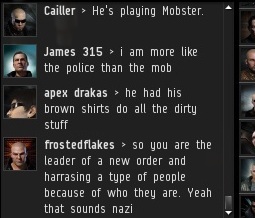 Is there anything in the code about blocking the Savior of High Sec or any of his Glorious agents? Because if not, there should be. If you block them you can't reply and are therefore asumed to be afk - bump. Done. Very good point. The people who block me or my Agents are doing themselves a lot more harm than good, even if they can't stomach the medicine we give them in local. I want to do my part to further the New Orders Glorious Message in my home in the heart of Gallente Space. To do so I wish to use the very simple of the might of the federation... the Megathron Class ship, to thrust those who do not abide the code deep into the cold bosom of space. 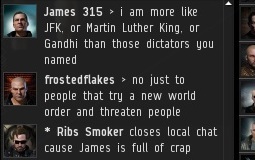 But I seek the guidance of the Glorious Savior of High Sec. Should I be able to make such a vessel approach and sustain 1500 M/s would this be sufficient to carry on your works? A megathron going 1500 m/s would be more than enough to send a mining ship reeling. I still recommend the use of a stabber; see the linked post on the "Become an Agent" page if you're interested in more info on that.